Kiki was born nine years ago today on a cold, January day. She didn't want to come into this world, or at least tried her best to stay in the womb. Which meant seventy-two hours of labor for me. Yeah, you read that right. SEVENTY-TWO. And from the minute she was born, she wanted to be held, and as you would expect, found the most comfort in my arms. Nine years have passed now, and I find Kiki is very much the same way today. Each year she gets a little more self-sufficient and seems to need me less and less. Yet there are times (mostly at night) she turns back into my baby again, and wants to cling and be held. I can't even count how many times I've heard her say "Mommy, I want you." I go to school to help out and her teacher is amused at how the independent, confident child he sees everyday, suddenly attaches herself to me minutes after I enter the classroom. 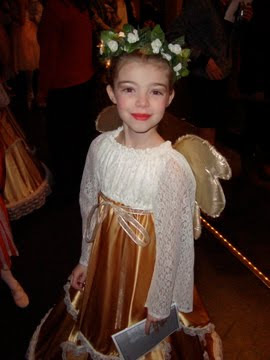 That same child didn't blink an eye this past August when she auditioned for a local production of the Nutcracker. Kiki walked right into the audition like it was just another day at school, with only a "Bye, Mommy." Didn't seem bothered at all that I couldn't go back with her, or watch, despite the fact that it was a completely strange, new place around a bunch of people she'd never met before. I have never been more proud of Kiki in all of her nine years. I truly don't think that as a grown adult, I could have handled myself as well as she did. She is so brave but fortunately for me she is still a Mommy's girl. The night she fell on stage, Kiki came home, curled up in my arms, just as she has done so many times before. I heard the all too familiar words, "Mommy, I want you." She may be nine, but she is still my baby. Happy Birthday, brave girl! I love you and am so proud to be your mom! Great post - thank you for sharing her stage with us!